This is a genuine xenon HID kit that is E4 & ISO-9001:2000 Approved. We have all bulb sizes available in 5000K, 6000K, 8000K, 10000K color. Our HID kits come with 12 Months Warranty directly with our factory. Combined ballast and starter unit for better performance and easy installation. Solid metal Waterproof/Weatherproof ballast. 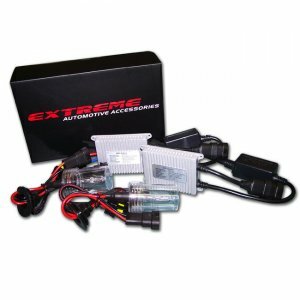 Voted #1 for highest quality HID kits. 3000K has an approx. 3500lm output, which is more than 3x the light output of the traditional halogen light and is the color temperature with the most output. The light appears golden yellow, it is ideal for customers drive in the fogs. 5000K has an approx. 3100lm output, which is more than 3x the light output of the traditional halogen light and is the color temperature with the most output. The light appears fairly white, it is ideal for customers who do a lot of canyon driving. 6000K has an approx. 2900lm output, which is 3x the light output of the traditional halogen light and slightly less light output compared to the 5000K. Although it has a bit lesser light output, it emits pure whiter light with a slight tint of blue. 8000K has an approx. 2500lm output, which is about 3x the light output of the traditional halogen light and slightly less light output compared to the 6000K. While it has a bit lesser light output, it emits bluer light than the 6000K. This is one of the most popular of all color temperatures. 10000K has an approx. 2300lm output, which is more than 2x the light output of the traditional halogen light. 10000K produces a deep blue light output approaching violet and the blue is noticeably deeper than the 8000K. This is the most popular color temperature.